Many historians believe that the three most crucial decades in world history occurred when a small group of men, mostly Jews under the power of the Holy Spirit, took the gospel to the world. 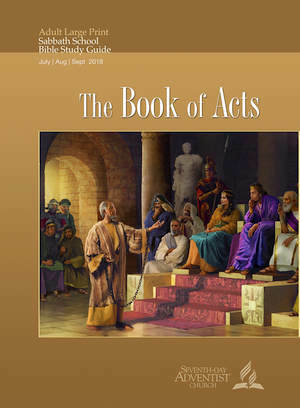 The book of Acts is an account of those three crucial decades, which spanned from the resurrection of Jesus, in A.D. 31, to the end of Paul’s first Roman imprisonment, in A.D. 62 (Acts 28:30). The book must have been written shortly thereafter, for it stops the narrative at that point, though evidence exists that Paul was released from that imprisonment and that he resumed his missionary endeavors, preaching and traveling until he was arrested a few years later and then executed in Rome, in A.D. 67. The book is silent about its author, but church tradition has always identified him as Luke, “the beloved physician” of Colossians 4:14 and traveling companion of Paul (2 Tim. 4:11, Philemon 24). Luke is also traditionally believed to be the author of our third Gospel, no doubt “the first book” mentioned in Acts 1:1 (compare with Luke 1:3). Both Luke and Acts are twin volumes on the beginnings of Christianity, respectively its origin (Jesus’ life and ministry) and expansion (the apostles’ missionary endeavors). Together they comprise about 27 percent of the New Testament, the largest contribution of a single author. Writing to the Colossians, Paul refers to Luke as a Gentile coworker, someone who was not “of the circumcision” (Col. 4:7-14). Luke, then, is the only non-Jewish author of a New Testament book. Other important themes found in Acts include: the sovereignty of God and His divine purpose (Acts 17:24, 25; 20:27; 23:11); the exaltation of Jesus as Lord and Savior (Acts 2:32, 36; 3:13, 15; 4:10-12; 5:30, 31); and especially the role of the Spirit in empowering and guiding the church for its mission (Acts 2:1-4; 4:24-31; 8:14-17, 29, 39; 10:19, 20). In fact, the achievements of the early church were not the result of human wisdom or ability, though it pleased God to use someone like Paul to impact the world in a way that no other apostle did or perhaps was able to do (1 Cor. 15:10). Wilson Paroschi is a professor of New Testament interpretation at Brazil Adventist University (UNASP), in Engenheiro Coelho, São Paulo. He holds a PhD degree in New Testament from Andrews University (2004) and performed post-doctoral studies at the University of Heidelberg, Germany (2011). Read for This Week’s Study: Acts 1:6-8, Luke 24:25, Luke 24:44-48, Deut. 19:15, Acts 1:9-26, Prov. 16:33 . Jesus’ mission on earth was finished. God would soon send the Holy Spirit, who—ratifying their efforts with many signs and wonders—would empower and lead the disciples on a mission that would reach the ends of the earth. Jesus could not stay with them forever in human flesh. Not only did His incarnation impose upon Him a physical limitation in the context of a worldwide mission, but His ascension and exaltation in heaven were necessary in order for the Spirit to come. Study this week’s lesson to prepare for Sabbath, July 7. There are two kinds of Messianic prophecies in the Old Testament, one that anticipates a kingly Messiah who would rule forever (Ps. 89:3, 4, 35-37; Isa. 9:6, 7; Ezek. 37:25; Dan. 2:44; 7:13, 14), and one that predicts that the Messiah would die for the sins of the people (Isa. 52:13-53:12; Dan. 9:26). Such prophecies do not contradict each other. They just point to two consecutive phases of the Messiah’s ministry: first He would suffer, and then become King (Luke 17:24, 25; 24:25, 26). At first, the disciples shared this hope of a kingly Messiah. They believed that Jesus was the Messiah (Matt. 16:16, 20) and were sometimes caught bickering among themselves about who would sit on either side of Him when He was enthroned (Mark 10:35-37, Luke 9:46). Despite Jesus’ warnings about the fate that awaited Him, they simply could not understand what He meant. So, when He died, they became confused and discouraged. In their own words, “We had hoped that [H]e was the one who was going to redeem Israel” (Luke 24:21, NIV). The gift of the Spirit. The Spirit had always been active among God’s people. According to the prophets, however, there would be a special endowment of the Spirit in the future (Isa. 44:3; Joel 2:28, 29). As Jesus Himself was anointed with the Spirit, the Holy Spirit was already at work during the time of His ministry (Luke 4:18-21) but officially was not inaugurated until Christ’s exaltation in heaven (John 7:39, Acts 2:33). The role of witness. A witness is a firsthand account. The disciples were fully qualified to give such a witness (Acts 1:21, 22; 4:20; compare with 1 John 1:1-3) and were now commissioned to share with the world their unique experience with Jesus. The orientation of the mission. In Old Testament times, it was the nations that should be attracted to God (Isa. 2:1-5), not Israel that should “take” God to the nations. The few exceptions (for example, Jonah) do not invalidate the general rule. Now the strategy was different. Jerusalem was still the center, but rather than staying and building roots there, the disciples were expected to move out to the uttermost ends of the earth. Read Luke 24:44-48. What was the core message that the disciples should preach? In the forty days He spent with the disciples after the resurrection (Acts 1:3), Jesus must have explained much truth to them about the kingdom of God, even if there was still much they didn’t understand, as their question in Acts 1:6 showed. They were familiar with the prophecies but could now see them in a new light, a light shed from the Cross and the empty tomb (Acts 3:17-19). Read Acts 1:9-11. How does Luke portray the ascension of Jesus? What is the significance that there were two angels speaking to them (Deut. 19:15)? The ascension of Jesus was a supernatural act of God, one of many all through the Bible. This is implied by the way Luke describes it, with the passive eperthe (“He was taken up”, Acts 1:9, NKJV). Though used only here in the New Testament, this verbal form is found several times in the Greek version of the Old Testament (the Septuagint), all of them describing actions of God, which suggests that God Himself was the One who took Jesus up to heaven, as He was the One who raised Him from the dead (Acts 2:24, 32; Rom. 6:4; 10:9). Read Acts 1:12-14. Who else was in the upper room, and how did they prepare themselves for the coming of the Spirit? Having returned from the Mount of Olives, the disciples gathered in the upper guest room (in Latin, cenaculum) of a two-story private house in Jerusalem. Some women followers (Luke 8:1-3, 23:49, 24:1-12), as well as Jesus’ mother and brothers, were there with the disciples. Jesus’ brothers (Mark 6:3) were either younger sons of Joseph and Mary (Matt. 1:25, Luke 2:7) or, more likely, sons of Joseph’s first marriage, in which case Joseph would be widowed when he took Mary for his wife. Their presence among the disciples comes as a surprise, as they had always been rather skeptical toward Jesus (Mark 3:21, John 7:5). Yet, the resurrection and Jesus’ special appearance to James (1 Cor. 15:7) seems to have made all the difference. Later on James apparently would even replace Peter in the leadership of the Christian community (Acts 12:17; 15:13; 21:18; Gal. 2:9, 12). The choice, however, was to be made from among those who had accompanied the apostles throughout Jesus’ ministry. Paul would later insist that, despite not having been with the earthly Jesus, he was nevertheless entitled to the apostolic office because his encounter with Jesus on the road to Damascus qualified him to bear witness to His resurrection (1 Cor. 9:1). Though admitting to be as “one untimely born” (1 Cor. 15:8, ESV), Paul refused to consider himself less qualified than the other apostles (1 Cor. 9:2, Gal. 2:6-9). Only the Twelve and Paul, then, were “apostles” in the technical, authoritative sense (Acts 1:25, 26); yet, in its basic, general sense as envoys or messengers, the term also could be used for other gospel workers (Acts 14:4, 14, Gal. 1:19). Read Acts 1:23-26. How was Matthias chosen? The method they used to choose Matthias may seem strange, but the casting of lots was a long-established way of making decisions (for example, Lev. 16:5-10, Num. 26:55). In addition, the choice was between two previously recognized candidates of equal qualifications, not a step into the unknown. The believers also prayed to God, believing that the result would reflect His will (compare with Prov. 16:33). There is no evidence that the decision was ever challenged. After Pentecost, the casting of lots became no longer necessary due to the direct guidance of the Spirit (Acts 5:3, 11:15-18, 13:2, 16:6-9). Further Thought: “The whole interim period between Pentecost and the Parousia [Second Coming] (however long or short) is to be filled with the world-wide mission of the church in the power of the Spirit. Christ’s followers were both to announce what [H]e had achieved at [H]is first coming and to summon people to repent and believe in preparation for [H]is second coming. They were to be [H]is witnesses ‘to the ends of the earth’ ([Acts] 1:8) and ‘to the very end of the age.’ . . . We have no liberty to stop until both ends have been reached.”—John R. W. Stott, The Message of Acts: The Spirit, the Church & the World (Downers Grove: InterVarsity, 1990), p. 44. “The Saviour’s commission to the disciples included all the believers. It includes all believers in Christ to the end of time. It is a fatal mistake to suppose that the work of saving souls depends alone on the ordained minister. All to whom the heavenly inspiration has come are put in trust with the gospel. All who receive the life of Christ are ordained to work for the salvation of their fellow men. For this work the church was established, and all who take upon themselves its sacred vows are thereby pledged to be co-workers with Christ.”—Ellen G. White, The Desire of Ages, p. 822. What was the role of prayer in the early church? Is it a coincidence that at almost every decisive moment in its life, we find a reference to prayer (Acts 1:24; 8:14-17; 9:11, 12; 10:4, 9, 30; 13:2, 3)? What is the role of prayer in our lives? Worried, Fengyan brought Yang-yang to her home, and the two began to talk. Yang-yang spoke of hearing voices that commanded her to act violently. Fengyan called her pastor at the Tokyo Chinese Seventh-day Adventist Church. Pastor Yu Chuanfu was in the middle of Wednesday night prayer meeting, but he immediately came to her home and prayed and read the Bible with Yang-yang. Yang-yang liked the prayers and the Bible, and she began to read the Bible regularly as she stayed with her mother-in-law for a while. She also read books by Ellen White. The voices ceased, and she started to smile. She started to attend Sabbath services at the Tokyo Chinese church. Yang-yang’s husband was amazed at the change in his wife. He started going to church with Yang-yang and his mother. A year later, he and Yang-yang were baptized. The mother got rid of the idol and, several months later, she and her husband were baptized. And that’s not all. Yang-yang and Fengyan have been telling relatives back in China about God, and several have started attending Adventist churches there. Fengyan, 53, credits God and the Tokyo Chinese church for the remarkable transformation of her Chinese immigrant family. “Every Sabbath we have a place here to worship”, she said in an interview in the church sanctuary. The Tokyo Chinese church, the only Chinese-speaking Adventist church in Japan, opened with about five members in 2012 though the support of a Thirteenth Sabbath Offering. Today, the church is overflowing with 50 members and is planning to double the size of its sanctuary.